Miss Espionage is an agent for the West. At least she becomes one at the end of her first adventure and stays one for the second but since there were no more adventures after that second, it is hard to say. I would give her the benefit of the doubt considering that at the start of her career, she was a very accomplished agent for the failing German government and they did not treat her well at the end so she had little reason to stay on their side. Her pedigree as an agent was first rate being the daughter of the infamous Mata Hari, German operative extraordinaire during WWI and shot for her efforts when captured. Since she had to have been born a couple of years before her mother's war spying and execution in 1917, we can surmise that she was around 30 at the time of her activities in the recorded adventures. When we first see her she is very proud to be carrying on her mother's legacy but when her chief handler gets ticked off at her failure in her last mission, he decides she must die. Only the timely interruption of an Allied operative chasing her saves her life. That is enough to turn her to the other side. The other side, according to the second adventure is the "International Counter-Spy Organization". She is headquartered with them on the U.S. East Coast but travels wherever needed. She is very attractive and quite athletic and best of all totally fearless and self-confident. When she has to take on some bad guys she does not hesitate for a second and when needed she proves she has a very good right cross and darn good aim throwing rocks. From the pages of Power Comics, we get Miss Espionage. She came as an agent for the failing German army and left an agent for the Allies and the time in between was brief. Still she gave it a shot, literally. Note: titles in quotes are mine. From Power Comics #3 - Miss Espionage is sent on a mission by Nazi spy master Baron Von Bruno to steal a list of German traitors. The job goes badly and Von Bruno turns on her. 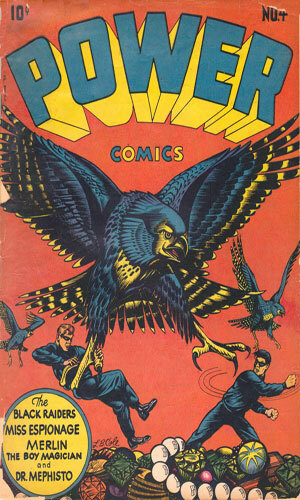 From Power Comics #4 - WWII is over but on the island of Hawaii, an arms dealer wanting to reignite hostilities is going to explode a volcano and blame the Japanese unless Miss Espionage can stop him. 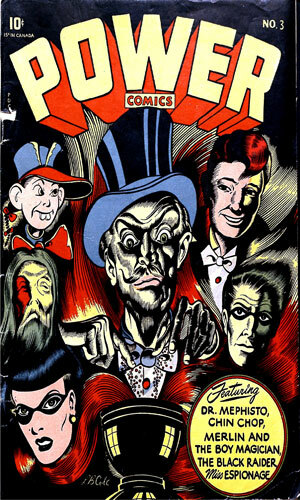 The two stories are typical 40s comic fare. The bad guys are especially despicable and disloyal. I mean it! Von Bruno sends her on a mission, she tries but comes up short, and he says she must die! Tough boss. Then an Allied soldier/operative saves her, talks to her for a couple of minutes, and she changes her life around. Good talk! What the heck! It was a filler series and it did its job. Furthermore, it might have become something better over time if it had the time which it didn't. Any comic that has a female protagonist not hesitant to let 'em have it with a solid punch is alright in my book. Reminds me of an older sister while growing up.